When MGM’s movie Gigi debuted in 1958 legions of little girls were captivated by the City of Lights and its magical allure. I know. I was one of them, listening hours on end to the vinyl soundtrack by Maurice Chevalier, Hermione Gingold, Louis Jourdan and Leslie Caron who transported us to a place we could only dream of. Raised by her grandmère Mamita a calligraphy teacher and her spotlessly mannered grande dame, Aunt Alicia, the spunky Gigi was a paragon of insouciance. We embraced her joie de vivre, studied our français more diligently and longed for a soigné and très riche gentleman like, Gaston Lachaille, to sweep us off our feet. Indeed postwar Paris was everyone’s dream of the most exciting place in the world to be. 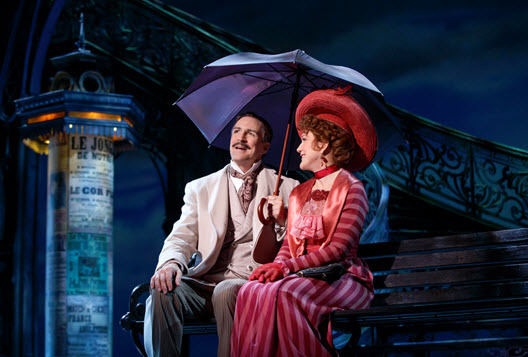 Fifteen years later Gigi was brought to the stage and another generation embraced Alan Jay Lerner’s and Frederick Lowe’s spectacular score and heartwarming tale. And now, 37 years hence, Director Eric Schaeffer has revived the musical in all its glorious splendor. I asked myself if it could have the same impact on a new audience as it did in the late 50’s. Does Gigi’s indelible charm translate to a more technologically absorbed generation of little girls? 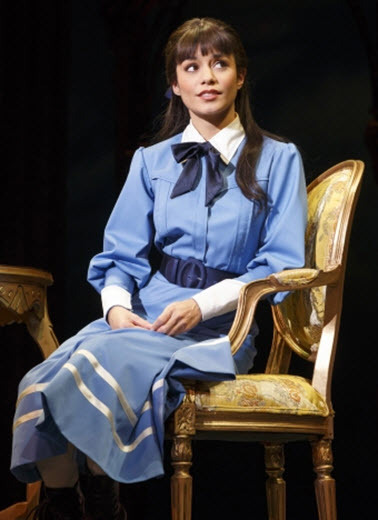 To insure it does, Schaeffer has wisely cast Vanesa Hudgens as Gigi. An adorable and multi-talented actress, best known for her role in the wildly popular High School Musical series, Hudgens proves her acting, dancing and singing have the snap, crackle and pop to earn her the lead role against such seasoned Broadway actors and opera-caliber voices as Victoria Clark (Mamita), Dee Hoty (Aunt Alicia), Howard McGillin (Honoré Lachaille) and Steffanie Leigh as Liane d’Exelmans, Gaston’s mistress. 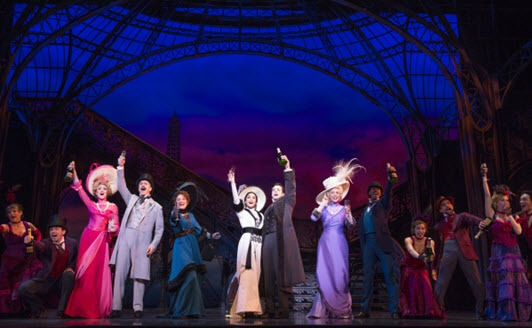 As you may recall Gigi is raised by her grandmother in a modest flat in Paris where the pair play frequent hosts to Gaston (Corey Cott), a dashing and well-to-do man about town who is an old family friend. Her sister Alicia, determined to marry Gigi off to a wealthy gentleman, is consumed with tutoring the girl in the art of feminine allure, including how to tell a real sapphire from a faux. “A girl must think constantly – – unless a man can tell,” she instructs her. It is La Belle Epoque, Maxim’s is in its heyday, and all of Paris is très gai. Set Designer Derek McLane captures the mood of the era with drop-dead sets evocative of the period. Maxim’s becomes a wonderland of Can Can girls high-kicking amid red velvet banquettes and flower-shaped chandeliers, while Paris is evoked with the massive curved iron girders of the Eiffel Tower and the beach at Trouville, where Gaston sees Gigi in a new light and his Uncle Honoré revives a romance with Mamita, is a splendid seascape. From five-time Tony Award-winning Costume Designer Catherine Zuber, we are treated to dreamy chiffon gowns, elegant frock coats, feathered picture hats, glittering jewels, bellmen in carmine britches and so much more extravagance. James Moore conducts the soaring strains of the 13-piece orchestra through the memorable songbook including “Thank Heaven for Little Girls”, “The Night They Invented Champagne” and sixteen other wonderful numbers. Emmy Award-winning Choreographer for the late, yet beloved, TV show Smash, Joshua Bergasse, enlivens the dancing with electrifying Broadway-bound energy. Through February 12th at the Kennedy Center, 2700 F St., NW, Washington, DC. For tickets and information call 202 467-4600 or visit www.Kennedy-Center.org.